If you enjoy attending car shows, swap meets, auctions and any other type of auto enthusiast events, then this post is for you. Every month we display some of the more notable shows and events coming up in various parts of the country. If you like to refurbish classic cars by placing them up on your Auto Lift, or just enjoy viewing these fine pieces of machinery up close, and speaking with other like-minded people. It’s here. The Daytona 500. The racing world’s biggest race is coming up this weekend, and everybody’s excited. Besides the buzz about the new surface, and the three lanes, there’s news about some of the top drivers. Dale Earnhardt Jr. got in a crash Wednesday during practice and will have to use a backup car and start from the rear of the pack. Then there’s the rule changes, like the size of the restrictor plates to slow things down. Experts predict the change will slow things down by about 2 MPH and keep the engine RPM’s down, which is actually preferred by the engine builders, who believe the RPM’s were getting too high. They hope to keep speeds down to below 200 MPH, as they were up to around 206 MPH in practice rounds. Fans obviously won’t be happy about this decision, nor will the drivers. The new surface has also helped to speed things up, as the old one was bumpy and not as slick. Combined with the new car nose design, It will allow them to draft all the way around the track. Some of the stars and the director for the upcoming new Transformers movie will serve as the Grand Marshals for the event. With Jr’s primary car up on the Auto Lift, he’ll start from the back of the pack. This is shaping up to be one of the best races ever. Make your predictions now. Who will win? We always share with you our customer pictures when customers are kind enough to share their experience and feedback with us. In this case, the customer is Karl Wilen out of Olatha, KS. He purchasedour BendPak MD-6XP Mid Rise Lift. This lift is extremely popular with the home / hobbyist crowd, because it’s got the features they want. The typical home / hobbyist doesn’t have a very tall ceiling, so they only need a lift that raises the vehicle to about 48 inches or so. They also like the fact that the lift is portable. You can just roll this thing around your shop, or even out your garage doors if you need to. 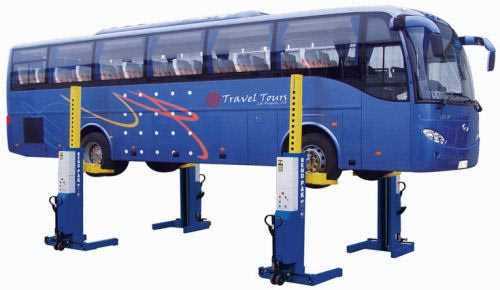 The Car Lift also offers access to most of the vehicle for servicing it. However, as with every lift, there are shortcomings. This lift doesn’t allow complete access to the underside of the car. When a lift is portable, it will typically have structural cross members that run from one side to the other, and they get in the way of accessing the very center of the underside of the car. You typically won’t be able to access catalytic converters, nor transmissions. But you can see what Karl did to modify his lift when he needed more access than this auto lift would provide. If you don’t have the luxury of parking your automobile in a garage on or under an Automotive Lift, and you live in the northern reaches of the United States, then this post is for you. Actually, considering the weather that Texas has been receiving recently, this very well could apply to most residents of the southern states as well. It’s true that this has been a particularly brutal winter. So it only stands to reason that some of our southern brethren are not as familiar with the tricks and tactics used to make life easier in these icy conditions. When you’re in a hurry to get to work, and you’ve got a layer of ice on your car, you don’t want to spend a half hour attempting to get in your car, and clearing all the windows. In anticipation of an ice, or snow storm, many people will place a tarp, or even cardboard over their windshield to help hasten their travels. No need to scrape that pesky ice off your windshield, or wait for it to melt after you blast you heater onto the windshield. Another tip is to lift your wiper blades off the windshield before an announced storm so that they do not freeze to the windshield and potentially get damaged when you try to free them from the ice. Also try to delay turning on the wipers until they can run freely. If they are still frozen to your windshield, and you leave the motor on, you risk burning out the wiper motor. Some cars may have doors that freeze shut due to a build up of ice inside the space between the door and vehicle body. Some folks will try a hair blow drier, but a faster solution would be to pour cool water onto the area where you suspect the ice to be. Be careful not to use warm water, as this could cause freezing cold windows to crack from the rapid disparity in temperature. The worst case scenario is when you are in such a hurry that you don’t take the time to clean off your vehicle properly. Then you wind up getting in an accident and you end up with your car on an Auto Lift because you didn’t clean off your windows properly. Try these tips, and you’ll be able to get on your way more quickly and safely. Tire pressure Monitoring Systems have been required on all new vehicles for the past couple of years. The new RediSensor tire pressure monitoring system from Continental is causing quite a stir. The reason is that it offers an effective piece of equipment that doesn’t require any special installation tools that many other TPMS systems require. It fits a wide range of cars and trucks and makes life a lot easier for technicians and is reliable for consumers as well. It works with all major scan tools and doesn’t require any special programming. It even re-learns quickly to the specific vehicle, much like an OE sensor. According to the manufacturer, it is ready right out of the box. Plus, it fits a wide variety of cars and trucks. They presented the product at the AAPEX show, and it was a hit. Expect this product to be the choice of most shops when the car is up on the Auto Lift, and the wheel is on the Tire Changer. Anything that increases productivity and makes the technicians life easier always sells well. We’re asking technicians out there, What do you think of this new technology? Is this really as significant an advancement in technology as the manufacturer states? Let us know. The nation has been hit hard by winter weather so far this year. The eastern seaboard has been hit by storm after storm, with ice storms hammering as far south as Georgia. They’re not familiar with frozen precipitation that far south, so on those rare occasions when it occurs, you can bet it brings them to a standstill. Inclement weather is usually cursed by most drivers, and when it causes the predictable fender-benders, the only people happy are the body shop owners and tow truck / wrecker drivers. Profits pick up in the winter season for those shops that specialize in body work, frame straightening, and tire shops, since many customers will swap their all weather tires for snow tires. Garage owners with the latest Tire Changer with all the bells and whistles finally have a way to pay for that investment. The typical damage will be minor, just a dent or two, but there usually are a healthy dose of more significant accidents that can be serious. When your automobile is up on the Auto Lift, just remember to be thankful that nobody was injured. Modern vehicles have many advantages over vehicles from the past. Anti Lock brakes, traction control, all wheel, and four wheel drive being the most notable. Tires are more advanced than ever. And vehicles protect the passengers better than ever with air bags and crumple zones. What about you? Do you have any stories about an accident you’ve had that was particularly scary or interesting, or even humorous? Leave a comment below. Check out the video below of some crazy footage of accidents too. Conventional wisdom states that one of the main reasons US automakers fell into financial peril over the past decade is because they were behind the times. They don’t offer what the people want. They don’t offer any smaller vehicles. No hybrids, no eco – friendly automobiles. No low gas consumption cars. Well, if the current car show in Detroit is any gauge, they got the message. Most of the vehicles they are spotlighting are the smaller, modern, high mileage and environmentally friendly cars. The Chevy Volt just won car of the year at the Detroit Auto Show. They’ve gone out of their way to come up with automobiles that comply with the increasing CAFE standards that require cars to meet higher fuel efficiency standards. After fuel prices went up dramatically in 2008 due to higher oil prices, industry experts predicted there would be a seismic shift in Americans driving habits. Forecasts were for everyone to sell their SUV and Trucks and to finally make the move to hybrid and fuel efficient cars. While there has been a trickle of people sticking their toes in the water, most American consumers appear to be set in their ways. They just don’t seem to be ready yet to forsake the spaciousness of their roomy SUV’s and trucks. And who can blame them? You certainly can’t get your family around comfortably in a compact car. And what about getting in an accident? If you are unfortunate enough to get in an accident with one of those compact cars, you are not only much more likely to spend more when the car is up on the Auto Lift due to damage, but you are also much more likely to get injured. As we pointed out in a previous post, sales of trucks and SUV’s were up 30% in the USA in 2010, while hybrid sales were down. Industry analysts do predict rising fuel costs for 2011, so it remains to be seen at what point the American driver will reach his breaking point when it comes to fuel efficient cars. If there is a dramatic increase in gasoline prices, Detroit is much better positioned than in years past to handle it due to it’s wider range of offerings in the small car and alternative fuel categories. Shocks and struts are just one of many components of a vehicle that effect drivability and comfort of the ride. The obvious initial impact on driving relates to the main purpose of shocks and struts – decreasing the impact of a rough road to give you a smooth ride. This is an important function, but there are others that may not be as obvious. Automotive Shocks and struts also effect ride control in various ways, but perhaps more important ways, such as braking, traction and handling. It can even have an impact on tire tread wear. Modern vehicles have such technologically advanced driving systems that require every component to work as it was intended. If one component is out of whack, it could effect the whole system. Most manufacturers recommend replacing these parts at regular intervals, with most recommending around every 50,000 miles or so. So it’s about much more than just comfort. It’s also about safety. The next time you are going over the virtues of replacing shocks and struts with your customer, remember to inform them of the importance of the safety issues mentioned above. This is another case where you may have a customer’s car up on the Auto Lift for a different job, but you can up-sell them on another service they may not have been aware that they needed. If you are an auto shop owner who has a waste oil heater and uses it to save money on both disposing of your waste oil, along with saving money on when it comes to heating your shop, you may want to pay attention to this story, because it could affect your bottom line dramatically. The Environmental Protection Agency recently considered a proposal for new rules regarding the burning of waste oil. The proposal is considering whether the fuels are considered solid waste or not and the answer to that question could have huge ramifications for the automotive industry. If they waste fuels are defined as solid waste, under the RCRA act, (Resource Conservation & Recovery Act) then any combustion unit that burns it will be required to meet more strict emissions standards. The EPA is proposing requirements on air emissions for Industrial, Commercial and institutional boilers and process heaters under CAA rulings for waste incineration units. Given the onerous costs and regulations that small automotive shops must meet, any new rulings of this type could have a burdensome impact on profits. Many shop owners in colder climates rely on waste oil heaters as a secondary or even primary source of heat. When service technicians have an automobile up on the Auto Lift, they need to be comfortable in order to remain productive. The government authorities have to weigh the impact of these units on the environment along with the impact on the shop owner’s bottom line. What do you think? Should the waste oil burners that auto shops use be required to pass more strict emissions standards?